Click on the small images to see larger ones. This is the Ant planetary nebula, Menzel 3 (Mz 3). You can see a much more detailed image of Menzel 3 here. Avedisova lists the ionising stars as the O6 III giant CD -51 9977, the B 0.5 Ia supergiant CP -51 9180 and the B1 Iab supergiant CD -51 9950. According to a 2005 paper, RCW 102 consists of two objects at different distances. RCW 102b appears to be ionised by the O6 III giant LS 3539 = CD -51 9977. The photometric distance to the star is 4800 parsecs. (Although, confusingly, the paper refers to a second photometric estimate for other nearby stars of 4200 parsecs.) In contrast, the kinematic distance to the gas appears to be significantly less, 3500 parsecs, suggesting significant velocity dispersion in the Scutum-Crux (Centaurus) arm. RCW 102 appears in the direction of the OB association R103 along with the supernova remnant RCW 103 and the HII region RCW 106. RCW 102 is visible (although faint) in hydrogen-alpha but seems invisible at infrared and radio frequencies. It appears near the centre of a large bubble-like structure visible in this Parkes radio image here and in this MSX infrared image here. You can view a rare visual image of this little photographed nebula here. This is the 2000 year old supernova remnant SNR 332.4-00.4, which can be seen as the prominent circle in this radio survey and in X-rays in this Chandra image..
You can seem a very good visible light image of RCW 104 at the Astrodon Imaging website. Avedisova lists 4 ionising O-stars: the O7 V HD 144918, the O7 V: HD 330386, the O8.5 V HD 144647 and the O9 IV subgiant HD 144900. She places the nebula in star formation region SFR 332.86+1.85 along the dark globule FeSt 2-212. The nebula appears to be surrounded by numerous small molecular clouds listed in the [YSM99] catalog and is likely embedded in the compact OB association R105. Humphreys gives a distance estimate of 1580 parsecs for the R105 association. Kharchenko calls this association Nor OB5 and lists the O9 V HD 144695 and 4 ionising B-stars in addition to three of the O-stars mentioned by Avedisova. She gives an age of 12.8 million years and a distance of 1800 parsecs. 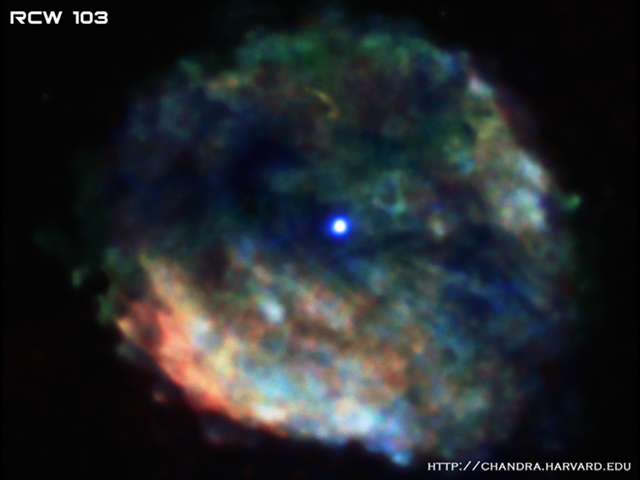 RCW 105 / Gum 51 has a spectacular bubble structure in infrared, as can be seen in this MSX image. You can see a visible light image here. The massive star formation region RCW 106 is visible in the direction of the R103 OB association and is embedded in a 100 thousand solar mass 28 pc x 94 pc giant molecular cloud. It is ionised in part by the two obscured infrared star clusters slightly separated from the visible luminosity: IRAS 16132-5039 and IRAS 16177-5018. IRAS 16177-5018 contains the ultrahot star [RAL2003] IRS 1, which is probably an O3 I supergiant. IRAS 16132-5039 contains the O9.5 V / B0 V star [RA2004a] IRS 3. Avedisova places RCW 106 in the star formation region SFR 332.87-0.64 with 97 components, including 25 masers. You can view the RCW 106 complex in this Spitzer infrared image anhd get a wider scale view in this MSX infrared image. This is the larger nebula visible in the direction of the RCW 106 star formation region. This is the smaller nebula visible in the direction of the RCW 106 star formation region. This bipolar HII region, also called NGC 6164/6165, is associated with the peculiar O-class variable star HD 148937 and is located within the Ara OB1a association. There are good visual images of this object here, here, and here. The massive star formation region RCW 108, also called the Rim nebula, NGC 6188, and Gum 53, is ionised by the Ara OB1a association and its core star cluster NGC 6193. Humphreys gives a distance of 1380 parsecs for Ara OB1a. Avedisova places it in star formation region SFR 336.43-1.26 along with the star cluster NGC 6193, the molecular cloud [TUW2004] SFO 79 and the dark cloud DCld 336.4-01.5. Kharchenko lists the O7 V multiple star HD 150135 and 3 ionising B-stars in NGC 6193. She gives an age of 7.9 million years and a distance of 1155 parsecs. A 2008 study adds a second O-star to NGC 6193, the ultrahot O3+O6V multiple HD 150136. The region also contains the infrared cluster RCW 108-IR, which includes a probable O9 class star. A good black and white hydrogen-alpha image of this region can be found here. Full colour images are here, here and here. You can see the MSX infrared image here. This is the core of the Rim nebula, RCW 108. There is no visible nebulosity at this location, which is at the edge of the massive star cluster Westerlund 1, and no obvious emission at radio or infrared frequencies either. This object is described in the RCW catalog as a 2x2 arcminute bright nebula but in the RCW notes as "Stellar-like", and so may not be a nebula at all. Curiously, SIMBAD gives slightly incorrect coordinates for this object - they differ by about 0.11 degrees from the ones given in the RCW catalog. RCW 110 and RCW 111 appear to be bright spots in the same object, Gum 54. Avedisova lists two O8.5 V class ionising stars for RCW 110: CD -45 11051 and CD -45 11034. She places both RCW 110 and RCW 111 in star formation region SFR 340.79-1.01 along with two masers, the star cluster Lynga 14 and the HII region IRAS 16506-4512. SIMBAD gives a G0 class for CD -45 11051 but this is contradicted by several other papers that support a O8.5 class for this star. (Perhaps G0 is the class of a companion star?) SIMBAD also says that CD -45 11034 is a member of Lynga 14. Alex Rodgers, Colin Campbell, and John Whiteoak, working at Australia's Mount Stromlo observatory under the direction of Dutch-American astronomer Bart Bok, published their nebula catalog in 1960. The RCW catalog is largely an expansion of Colin Gum's 1955 catalog. Although astronomers publish articles referring to the RCW nebulae almost every month, there seems to be few places on the Internet that bring together information on these nebulae as a whole - unlike, for example, the Messier catalog. This is most likely because the Messier objects are visible to anyone with a pair of binoculars or a small telescope. Most of the RCW objects are clearly visible only in long exposure CCD images or photographic plates taken by large telescopes. Fortunately some of these plates have now been digitally scanned and made publicly available. Many of the brightest and most beautiful Milky Way star formation regions visible from the southern hemisphere are in the RCW catalog so the 182 objects it contains are well worth examining carefully. (In fact there are more than 182 objects as subsequent research has shown that some of the RCW nebulae consist of more than one object.) At least 50 objects in the RCW catalog are also in the Sharpless catalog and I have noted this in the descriptions of these objects. Most of the images used to illustrate the RCW catalog were created using the SuperCOSMOS Sky Survey, with red = hydrogen-alpha, blue = UKST Blue and green = UKST Infrared. Because green represents infrared, the images are not quite the same as would be seen at purely visual frequencies. Green in these images usually reveals warm dust or red giant stars. These images were created using the POSS-II/UKSTU data of the Digitized Sky Survey and SuperCOSMOS using the process described here. The compressed files of the "Palomar Observatory - Space Telescope Science Institute Digital Sky Survey" of the northern sky, based on scans of the Second Palomar Sky Survey are copyright © 1993-1995 by the California Institute of Technology and are distributed herein by agreement. The compressed files of the "Palomar Observatory - Space Telescope Science Institute Digital Sky Survey" of the northern sky, based on scans of the Second Palomar Sky Survey are copyright © 1993-1995 by the California Institute of Technology and are distributed herein by agreement.